Nothing can be more dangerous than a deceivers words or a temptress guiles. A clever woman might strip away a man like Conans defenses and strike him down with the Conan the Barbarian Cimmerian Temptress Dragon Dagger by Marto. This beautiful dagger, while striking, is curiously named. A tempter might seek a less obvious, less eye-catching weapon to bear, although to one skilled enough in manipulation, the most obvious weapon in the world pales in comparison. With a gleaming blade made from tempered steel, this dagger serves to get the job done and to look good while doing it. The hilt is silver-plated and set with ruby-colored jewels, while the guard features two winged dragons. And the final touch is the addition of a second weapon. 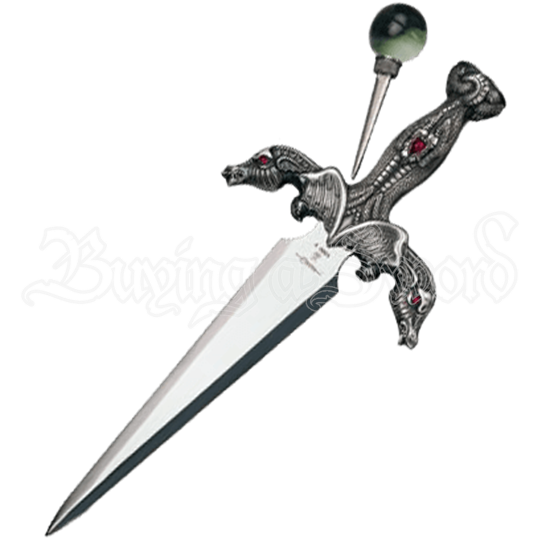 The pommel features an emerald sphere which can be removed, revealing a miniature blade. 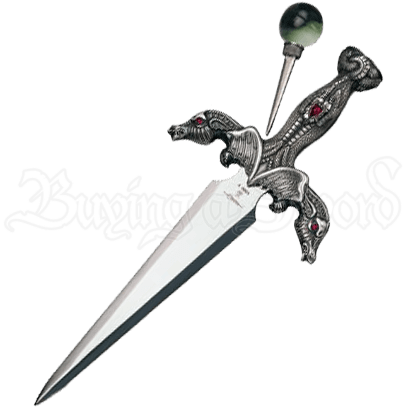 Secondary only to a clever tempters tongue, the Conan the Barbarian Cimmerian Temptress Dragon Dagger by Marto is still an adequate back-up weapon for a deceiver to possessor any collector who is looking to acquire a stylish dagger.